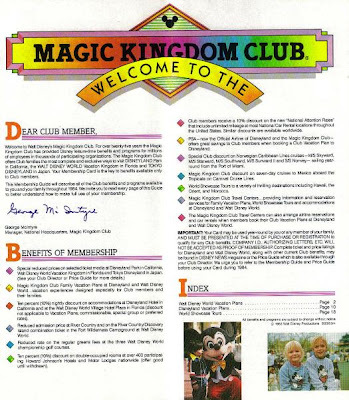 With all the recent discussion about D23 and the history of organized associations, I thought a look at the benefits of Disney’s theme park club for Walt Disney World, specifically from the 1984 Membership Guide, would be interesting. The Magic Kingdom Club began in 1957 as a win-win opportunity for companies and Disneyland. Membership cards and information guides, that included facts on discounted tickets and trips, were handed out free to employees at participating companies and military organizations. The benefits and involvement grew as Disneyland spawned its East Coast sibling, Walt Disney World. Further expansion continued with the additions of Tokyo Disneyland and EuroDisneyland to the theme park family, before the Magic Kingdom Club was disbanded in 2000. The Magic Kingdom Club also published the quarterly magazine Disney News, which later became the Disney News Magazine, and then, simply, The Disney Magazine. This publication ran at varying price points over the years, but a subscription generally ran for two years/8 issues. At Walt Disney World, the World Vacations ranged from five to seven nights, with the ability to add on nights if needed, A basic five night plan included: Five nights’ accommodations, six days use of the Walt Disney World transportation system, six days admission and unlimited attraction use, six days unlimited use of recreational activities and facilities, three meals per day at a wide variety of Walt Disney World restaurants, Birnbaum’s Official Guide to Walt Disney World (one per group), and a ten dollar certificate for merchandise (one per adult). There were also Camping Jamborees (Fort Wilderness Campground), Village Holidays (Walt Disney World Village Hotel Plaza), and Family Getaways (which includes accommodations at Howard Johnson’s, Holiday Inn, Quality Inn, etc. ), each having specific length of stay designations and amenities. Seminar Vacations, a prelude to the Disney Institute, were also available to club members. These vacation plans included the ability to learn, “Disney-Style,” about horticulture, culinary arts, and Disney history/philosophy/entertainment/art. 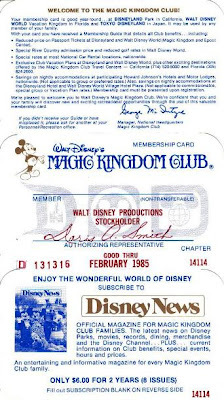 In addition to discounted vacations to Walt Disney World and Disneyland, the Magic Kingdom Club membership also included packages abroad and on the high seas. The World Showcase Tours (such a catchy name) included trips to Hawaii, Far East (where stops were scheduled in Tokyo, Tokyo Disneyland, Kyoto, Hong Kong, Thailand, and Singapore), and Morocco, while the Cruise Adventures featured Carnival cruises to Mexico and Norwegian Caribbean cruises to the Caribbean and Bahamas. While the Magic Kingdom Club may be a fond memory of the bygone days of Disney, it is my opinion that many of the offerings are still available through Disney and the Magic Your Way vacation packages, as well as the Adventures by Disney. As for the loss of Disney News, from my first impression of Disney’s Twenty-Three, this publication will be as good, if not better, for the fans of all that Disney produces. Still, it is always fun to look back at the days that were.